Spanish Minister of the Interior, Juan Ignacio Zoido, paid a short visit to Rabat on Tuesday, during which he discussed with his Moroccan counterpart, Abdelaouafi Laftit, means of upgrading their already fruitful cooperation against organized crime and primarily terrorism. 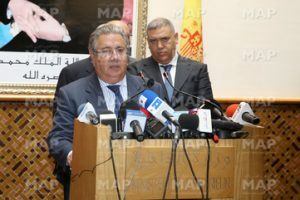 The two ministers hailed, at a joint press briefing, the cooperation existing between the two countries’ security services, citing the contribution of Morocco in the investigation of the two terrorist attacks that hit Barcelona and Cambrils lately, killing 16 people and wounding about one hundred others. Juan Ignacio Zoido who described the Moroccan security services’ anti-terrorist collaboration as “permanent, reliable and fruitful,” said permanent contact and cooperation between the two countries’ services yield “good results on the ground”. Spain hopes to upgrade its cooperation with Morocco, so that antiterrorism struggle be more efficient, adapted to the evolution of terrorist methods and able to anticipate new forms of radicalization, he said. “The fight against terror will not be easy… and unfortunately there will be other victims,” he said, adding, “We are convinced that no country is immune to the terrorist threat”. Only international cooperation can eradicate the plague and “the help of everyone, particularly Morocco, is the key to winning this fight,” the Spanish official said. He added confidently however, “We can defeat the terrorism that seeks to destroy our way of life, our freedom, our democracy and our rights”. The two Ministers of the Interior both indicated that cooperation between the two countries in security matters allowed the dismantling of several terrorist cells in Morocco and Spain. Between 2014 and 2017, Spanish and Moroccan security services led 12 joint operations that led to the arrest of 175 people suspected of violent extremism. Concerning the ongoing investigations on the two attacks in Catalonia, they said they are conducted in total collaboration between the two States and Moroccan experts are contributing to the investigations. As to the perpetrators of the terrorist attacks in Catalonia, the Spanish official acknowledged that they are Moroccans but were raised in Spain. He recalled that 11 of the 12 terrorists involved in Catalonia attacks are of Moroccan origin but they grew up in Spain and the twelfth terrorist was even born in Spain. “Since an early age, these terrorists moved in to Spain where they grew up and received their education,” the Spanish official noted. The Moroccan Interior Minister Abdelaouafi Laftit also brought up the issue of the children of the second and third generation of Moroccan immigrants who have emerged in European countries, underscoring that “they need special attention to help them escape the clutches of terrorism, in uncontrolled mosques or in the hands of some extremist imams”. Written by: Jaber Ali on August 30, 2017. Posted by Jaber Ali on Aug 30 2017. Filed under Headlines, World News. You can follow any responses to this entry through the RSS 2.0. Both comments and pings are currently closed.